Storm surge is the abnormal rise in sea level generated by a hurricane or other intense storm, over and above the predicted or normal astronomical tide. It is caused mainly by atmospheric weather systems such as tropical cyclones, hurricane winds shoving the ocean water up over the coast, although low pressure in the eye also contributes a much smaller amount. The height of water level rise due to storm surge is the difference at the coast between the observed level of the sea surface and the level that would have occurred in the absence of the tropical cyclone. What is the interaction of astronomical tide with storm surge? In general one may expect that if there is a storm surge of x metres and tidal wave of y metres then during high tide total surges would be x+y and during low tide x-y. But, it is found that there is an interaction of storm surge with astronomical tide, and during high tide time the total surge is little less than x+y and during low tide time it is little more than x-y. 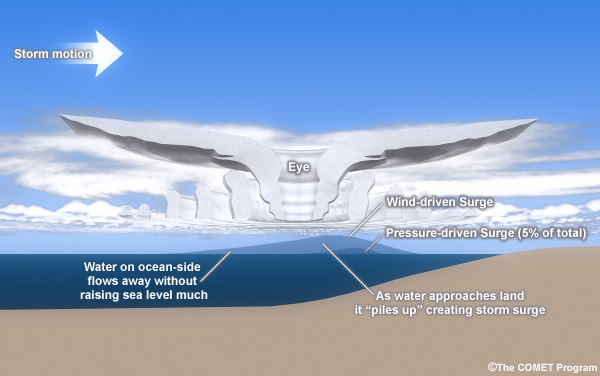 What are the factors influencing storm surge? What is the vulnerability of our coastline from the point of view of storm surge potential? You need to plan well ahead of time. If you live or work in the coastal area, find out from your local Emergency Services or local council whether you are in a surge-prone area. If you are, decide where you will go in the event of a storm surge. You might have a friend living on higher ground with whom you could go and stay. Wherever your nearest safe high ground shelter might be, work out the safest way to get there. ADCIRC is a (parallel) ADvanced CIRCulation model for oceanic, coastal and estuarine waters developed by Dr. R.A. Luettich, Jr, University of North Carolina at Chapel hill, Institute of Marine Sciences (email: rick_luettich@unc.edu) and Dr. J.J. Westerink, Department of Civil Engineering and Geological Sciences, University OF Notre Dame (email: jjw@photius.ce.nd.edu).